On page 11 of the most recent Health Care Complaints Commission investigation into the Australian Vaccination-Skeptics Network, we see the absurdity of vaccines causing autism rearing its head. The AVSN claim to present on their website 68 “medical journal studies [that] support the link between vaccination and autism”. According to the HCCC the expert they consulted concluded a case of correlation confused as causation was evident. A read of the list shows the expert is being kind in no small part. Given that the AVSN claim these studies show a link between vaccines and autism, the list is quite absurd. Despite the absence of mercury in childhood vaccines we get much on environmental mercury and autism, ADHD and blood mercury levels, swollen brains and autism, etc. But we have a numeric problem Houston. Of the 68 (cough) articles, I could count just 30 that included the word “vaccine” or “vaccination” in the title, abstract or conclusion. But maybe I’m expecting too much. Articles are numbered but items 5, 12, 48, 49 and 68 don’t exist. At all. The AVSN use the typical misinformation that succeeds at confusing young worried parents and educated, affluent parents who can afford lots of Internet time. Such as citing the damage huge doses of certain toxins or heavy metals can do, without stressing vaccines contain either another variant or minuscule amounts long shown to be perfectly safe. Since having changed their byline from Love them, Protect them, Never inject them to Because every issue has two sides, they have done a poor job of presenting both sides. The AVSN for example do not provide access to the Institute Of Medicine publication, Adverse Effects Of Vaccines; Evidence and Causality. This has been pointed out by the HCCC along with a host of biased schemes the AVSN execute in the hope of driving the public away from vaccination. In addition the hubris-riddled response that has been crafted for the HCCC and published online, is indicative of a mindset with no concept of community responsibility. There is no evidence that thiomersal (a mercury based preservative) in vaccines has caused any health problems, except perhaps minor reactions such as redness at the injection site. […] The form of organic mercury contained within thiomersal is “ethyl mercury” which doesn’t accumulate in the body, unlike the closely related methyl mercury which does accumulate and is neurotoxic. […] MMR vaccine and other live attenuated viral vaccines never contained thiomersal. The Office of Liquor Gaming and Racing has confirmed it is investigating ”problems” in the Australian Vaccination-Skeptics Network’s financial statements. The 2008 financial statement said the group had more than $50,500 of assets, yet in its 2009 statement, assets from 2008 are listed as only about half that amount. And nearly two-thirds of $281,855 in expenses listed on its 2010 financial statements are not explained, given only the title ”other expenses”. The 2012 statement for the group has not been submitted. A chartered accountant who examined the documents for Fairfax Media, but declined to be named for fear he would be harassed, said the documents were ”the worst set of financial statements I have ever seen”. $2 million! And where is that money? Well, you see… no-one really knows. A visit to this document reveals a copious tally of financial irregularities and charitable breaches by the (then) AVN. Both the Charitable Fundraising and Charitable Trusts Acts are called into question, “on a number of occasions” according to the NSW state watchdog, the OLGR. 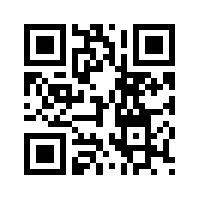 Published just recently at Diluted Thinking the article, AVSN Pays Meryl Dorey is a must read. It is a thorough breakdown of financial irregularities and unanswered questions from 2004 to 2008. It is of course beyond ironic that a hero of the AVSN is disgraced “vaccine/autism” fraudster, Andrew Wakefield. It’s old news that Brian Deer was able to track Andrew Wakefield’s scam because the latter had left a trail of intriguing financial records and/or references. Follow the money was what Deer did in true investigative journalistic style. It is indeed somewhat silly that the anti-vaccine lobby today bellow follow the money, but in doing so can draw only one step from a vaccine to its manufacturer. The money trail Deer uncovered was far more impressive. Wakefield was paid £150 plus expenses per hour by Richard Barr’s law firm. In total this came to £435 643, which was arguably to create a syndrome to drive the class action of anti-vaccine and genuinely misled (by Wakefield) litigants. Based on this, on September 9th 1996 a client of Richard Barr known as Child 2 was the first child subject to what the GMC later described as a “clinically unwarranted” ileocolonoscopy. In view of the unique services offered by the Company and its technology, particularly for the molecular diagnostic, the assays can command premium prices. The ability of the Company to commercialise its candidate products depends upon the extent to which reimbursement for the cost of such products will be available from government health administration authorities, private health providers and, in the context of the molecular diagnostic, the Legal Aid Board. More could be gleaned from a confidential submission (1999) to the Legal Aid board in his quest to secure the future of an immunodiagnostic business he would be director of. Unigenetics Ltd was incorporated in February of that year with Dublin pathologist, John O’Leary and would be registered in the Republic of Ireland. 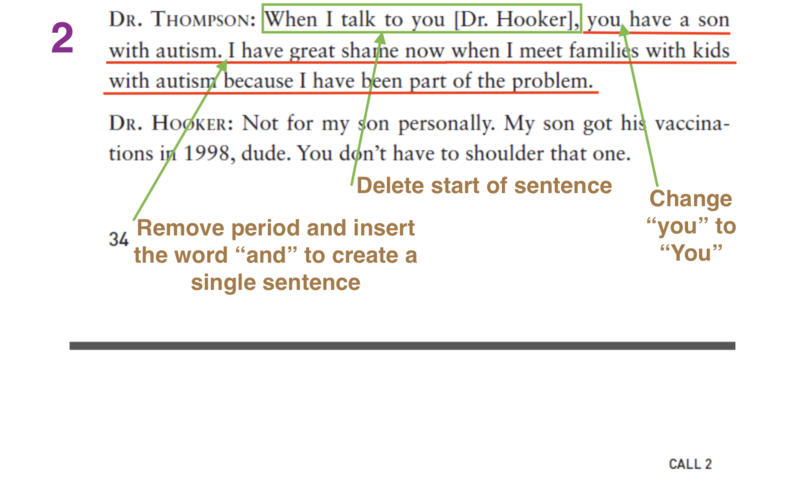 Here Wakefield argued the link b/w MMR and autism had been shown. 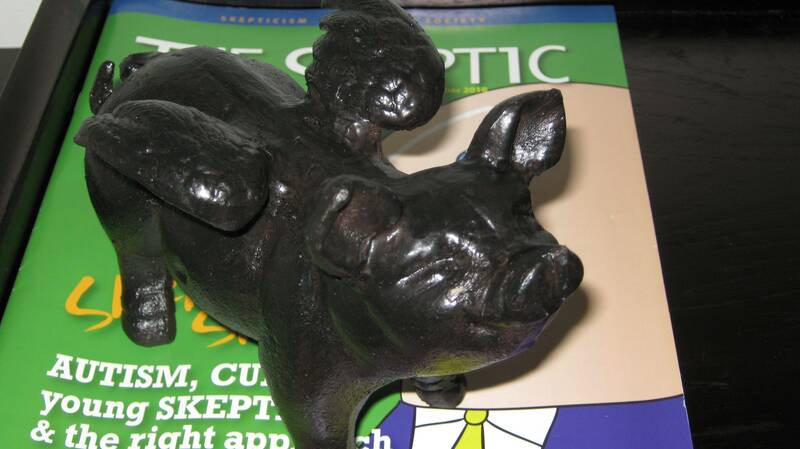 Unigenetics scored £800 000 of tax payer funds to conduct PCR tests of dubious pursuit. In addition to these petty “legal costs and salary” monies Wakefield would get another £90 000 per year – more than half of which was for travel. Deer reported that trading was to be fronted by another planned immunodiagnostic company Carmel Healthcare Ltd (also registered in the Irish Republic) and named after Wakefield’s wife. Within this venture Wakefield would take 37% of the earnings, the parent of child “Number 10″ would take 22.2%. A venture capitalist would get 18%. Royal Free’s professor of gastroenterology, Roy Pounder would get 11.7% and Professor John O’Leary another champion of “MMR causes autism” would get 11.1%. Deer was given a copy of a prospectus 35 pages long. This included confirmation of planned “litigation driven testing” from the USA and UK, along with delightful profit. Of course all business relied upon Wakefield’s new syndrome which at this point remained to be proven. As he had not found Crohn’s disease in the 12 children, Wakefield coined the term “autistic enterocolitis”. The prospectus sought to raise an investment of £700 000. It is estimated that the initial market for the diagnostic will be litigation driven testing of patients with autistic enterocolitis from both the UK and the USA… It is estimated that by year 3, income from this testing could be about £3 300 000 rising to about £28 000 000 as diagnostic testing in support of therapeutic regimes come on stream. Once the work of Professor O’Leary and Dr Wakefield is published, either late in 1999 or early in 2000, which will provide unequivocal evidence for the presence of the vaccine derived measles virus in biopsy samples the public and political pressure for a thorough, wide ranging investigation into the aetiology of the bowel conditions will be overwhelming. As a consequence of the public, political and legal pressures brought to bear, the demand for a diagnostic able to discriminate between wild type and vaccine derived measles strains will be enormous. Deer reported on yet another new company which was for the running of a joint business with the UCL medical school. Immunospecifics Biotechnologies Ltd would produce immunotherapeutics, vaccines and a diagnostic test. Beneficiaries were as with Carmel. Wakefield, the parent of “number 10”, the venture capatilist, Pounder and Prof. John O’Leary. There are issues around Wakefield’s immunodiagnostics which antivaccinationists should simply admit, and by not admitting such merely lend their cause less credence (if that were possible). Transfer factor for use in vaccines and treatments had basically been written out of the literature. A lack of evidence, risk of infection and unjustified cost had relegated this 1940’s blood product to the realm of an Internet peddled cure-all scam. The Neuro Immuno Therapeutics drama run by Hugh Fudenberg. To cure autism – which he reckons is caused by MMR – Hugh would use, you guessed it, Transfer factor. In August 2004 Brian Deer caught up with him. At the time he was under sanction for use and prescription of controlled drugs. Help yourself to a search-and-read on Hugh. If you remember Bill Maher’s claim that a flu shot five years consecutively equals a ten-fold increase in the chances of developing Alzheimers, you might be relieved to know that the source is Hugh Fudenberg. The Dublin measles tests which could not deliver consistency of results, emerged as a problem years later, during vaccine related lawsuits in the USA and Britain. But of course! Just as well that like the patent for immunodiagnostics he had the “safer vaccine” patent for the single measles vaccine. And he filed for this nine months before his now retracted paper was published. The present invention relates to a new vaccine for the elimination of MMR and measles virus and to a pharmaceutical or therapeutic composition for the treatment of IBD (Inflammatory Bowel Disease); particularly Crohn’s disease and Ulcerative Colitis and Regressive Behavioural Disease (RBD). What is needed therefore is a safer vaccine which does not give rise to these problems and a treatment for those with existing IBD. I have now discovered a combined vaccine/therapeutic agent which is not only most probably safer to administer to neonates and others by way of vaccination, but which also can be used to treat IBD whether as a complete cure or to alleviate symptoms. The provisional patent filing was entirely speculative and was for a possible therapy; as such, it had no bearing on the 1998 Lancet paper. That claim would have taken the word of Hugh Fudenberg at that particular time in history. The end for Wakefield came just after plans for Carmel Healthcare were finalised, potentially making way for his incredibly profitable business. A new head of medicine, Mark Pepys was appointed to the UCL Medical School (once known as the Royal Free and University College Medical School). He is a fellow of the Royal Society and ensured impressive grant money. He wasn’t impressed by Wakefield, threatening to not transfer his own unit to UCL if Wakefield was even there. Good scientific practice now demands that you and others seek to confirm or refute robustly, reliably, and above all reproducibly, the possible causal relationships between MMR vaccination and autism/“autistic enterocolitis”/inflammatory bowel disease that you have postulated. UCL were keen to help, offering him an ongoing position on staff or a full twelve months paid absence to allow for further research. 150 subjects would be provided to Wakefield. 12.5 times larger than his initial sample. Wakefield agreed. It is clear that academic freedom is essential, and cannot be traded. It is the unanimous decision of my collaborators and co-workers that it is only appropriate that we define our research objectives, we enact the studies as appropriately reviewed and approved, and we decide as and when we deem the work suitable for submission for peer review. After close to a decade of multiple studies had failed to replicate his “findings” or any link between MMR, its components and autism the Lancet retracted the Wakefield paper [Science Based Medicine] [BMJ] on February 2nd 2010. The journal’s editor, Richard Horton described the statements in the “fatally flawed” paper as “utterly false”. On May 25th of that year he was struck off the medical registrar by the General Medical Council. Still today, as is clear above, there are scam artists profitting from peddling the lie that vaccines cause autism. Their paper-thin efforts may well be pathetic but still have a measurably negative effect on public health. With no regard for evidence or responsibility for the consequences of their actions, one can hope that these arrogant fraudsters will one day too face the weight of the law. The month of June 2013 continued with a high turnover of media articles and internet publications of all types examining the antics and lack of evidence presented by Australia’s anti-vaccination lobby. The No Jab, No Play campaign was launched by The Sunday Telegraph and The Daily Telegraph on May 5th, 2013. It places pressure on parents who deny their own and other children the protection of vaccine induced immunity and herd immunity, to accept the community consequences of their decision. By May 29th it was announced that NSW Health Minister Jillian Skinner had amended the Public Health Act to make the checking of vaccine records compulsory and giving day-care centres the right to refuse access to unvaccinated children. Admitting children not vaccinated, could result in a $4,000 fine. On June 25th, Victorian Greens Senator Dr. Richard Di Natale reinforced how important it is to speak to a G.P. about vaccination. On June 14th, Neil Doorley on Today Tonight examined the potential tragedy of the tactics of Meryl Dorey and the deceptively named Australian Vaccination Network. Helen Kapalos opens the segment in part with, “The dirty tactics are unbelievable”. Rest assured all of those theories have been scientifically investigated and not one of them is true. The most infamous, blatant and callous fraudulent abuse of ignorance, doubt and understandable parental fear was committed by No-Longer-A-Doctor Andrew Wakefield back in 1998. Apart from filing for patents for monovalent (single shot) Measles, Mumps and Rubella vaccines he also stood to profit from two immunodiagnostic ventures. He remains an individual of iconic status for anti-vaccinationists, particularly Meryl Dorey. This deserves notice presently because the Wakefield fraud has recently come home to roost in Wales in the UK. This was the subject of an article on ABC Lateline last April 22nd. NSW Health Minister, Jillian Skinner informed State Parliament the Health Care Complaints Commission would launch an investigation, This was after the Opposition raised concerns that the AVN was using it’s Facebook page in this regard as a recruitment vehicle. Minister, what steps will you take to close this loophole?” he said. After her initial answer, The Health Minister Jillian Skinner later returned to give this update. “I’m advised that the Health Care Complaints Commission will be launching an investigation into the AVN,” she said. If passed, the new vaccination laws come into effect next January. Dorey herself has attempted to use the option of Apprehended Violence Orders to silence and potentially seriously irritate her critics. This was covered in May in the Telegraph by Peter Bodkin. An article at Diluted Thinking goes into this and the potential consequences quite thoroughly. The AVN continues to fight an order from the NSW Department of Fair Trading to change its name to something appropriate. That is, to one that represents it’s anti-vaccine stance. 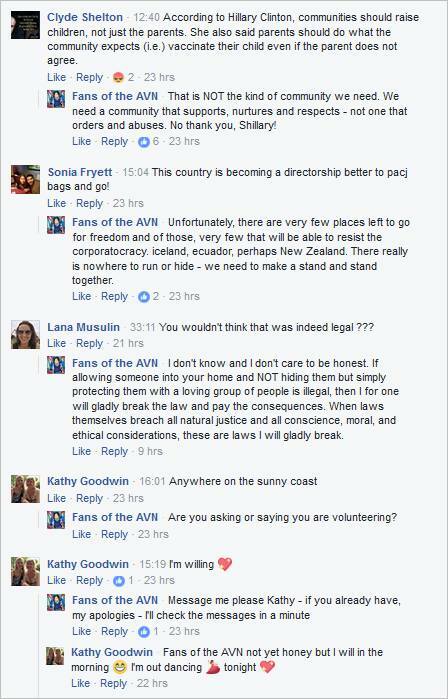 Also, as has been much anticipated, the AVN – involving a time of high activity attributed to Meryl Dorey – are being investigated for fraud. 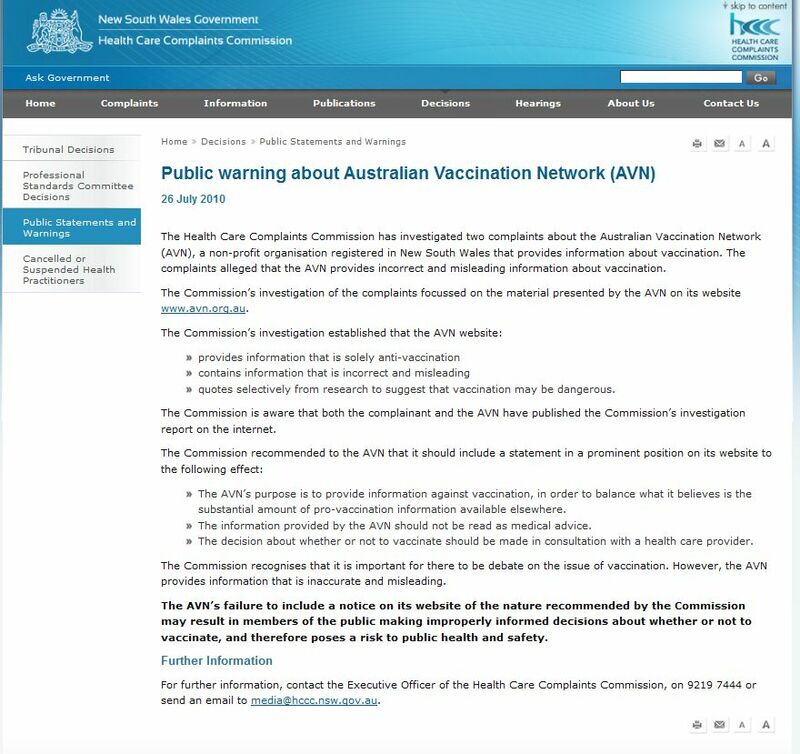 On June 25th, the ABC reported that the NSW Senate has passed a motion calling for the AVN to disband and cease it’s “unscientific scare campaign against vaccines”. Finally the month began to close with the AVN itself reinforcing the initial HCCC warning from July 2010. Proving yet again that they specialise in censoring and suppressing accurate information on both vaccines and the diseases they prevent, the so-called health group deleted material, and then blocked any further input from intensive care specialist, Dr. Rachael Heap. The AVN presented via their Facebook page that tetanus infection could be prevented by using tea tree oil on wounds, and that active bleeding would also prevent infection at a given site. But when intensive care specialist Dr Rachael Heap tried to post information about tetanus to balance the misinformation, the AVN first removed her posts and then blocked her. Tetanus is a bacterial disease that kills three out of every 100 people who catch it. It causes muscle spasms in the face, chest and neck, eventually progressing to the abdomen and back, causing the whole body to arch. Sometimes the spasms affect muscles that help with breathing, or can cause fractures and muscle tears. It can be avoided with a simple vaccination. “Tetanus is horrific, there is no cure if you get it, you end up in intensive care and then all you can do is support the patient and hope they heal,” Dr Heap said. 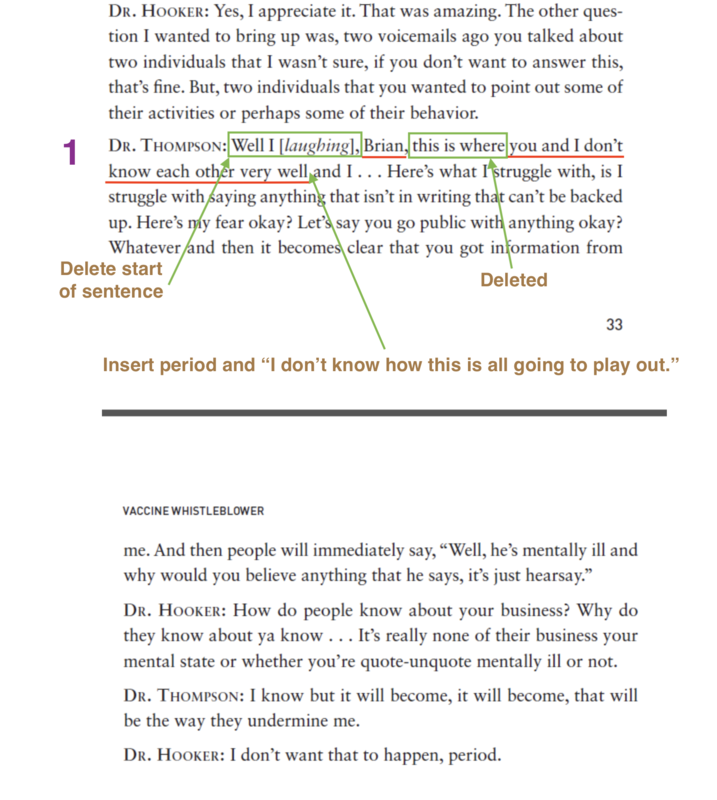 One of the deleted posts outlined what tetanus actually does. “I have cared for a patient with tetanus in Australia. It is agonising, and relentless. It can be fatal,” she said. Dr. Heap has made a complaint about this matter to The NSW Health Care Complaints Commission. Fortunately the AVN is now being held to account more often, with their tactics more regularly exposed. Natasha Bita: Award winner to crisis spinner? Natasha Bita published Virus in the system on May 28th, 2011. The article presents an extended account of the heart wrenching story of Saba Button who suffered permanent brain damage due to the CSL Fluvax influenza vaccine, in April 2010. A combination of H1N1 and seasonal influenza strains Fluvax is tolerated very well by adults. However for children under five a febrile convulsion rate of 0.33% was later clearly established in the only state to involve this age group: Western Australia. At the time the ABC reported hundreds of reactions. Of the 47 children taken to hospital, The West Australian reported 23 admissions. Saba Button was one such admission. Bita doesn’t provide these details, though to her credit does report that in 2009 fifteen kids under the age of 15 died after contracting swine flu. Each year between three and nine children die from influenza in Australia. The situation in W. A. following the use of Fluvax on small children reflects a 2006 study in which 1 febrile convulsion was recorded in a sample of 272. What emerged as deeply concerning is that 2006 fever (not convulsion) trial data rates were 39.5%. Yet Fluvax manufacturer CSL informed the TGA of their 2005 trial data on fever. A much lower 22.5%. Public confidence in regulation, safety, Good Manufacturing Practices (GMP) and ultimately use is vital. I’ve previously looked at the importance of holding CSL to account. A primary reason is that such stories are fodder for anti-vaccination lobbyists. Public confidence in immunisation was at stake, and proper context was much needed. One glaring absence from Bita’s article was reinforcement of the importance of vaccination in preventing influenza. With the internet awash with dangerous anti-vaccination propaganda readers need to know that all vaccination schedules are of paramount importance. The day Bita’s story was published anti-vaccination guru Meryl Dorey falsely claimed that “the skeptics” and Stop The AVN were “organising forces” to complain. I emailed Natasha that day seeking confirmation. After no reply I tried again on June 1st and CC’d The Australian online address. 16 days later I repeated this. Natasha eventually replied that no, she had received no complaints. Not one. However she had been away, she qualified. Strange, I thought. Was Bita suggesting that her absence equated to an inability to access emails, either later or indeed at any time? I began to feel somewhat uneasy about Bita’s impartiality. Clearly she knew who Meryl Dorey was. She was the woman who had just hijacked her published account to falsely claim, “babies were being used as guinea pigs in a trial that was paid for by the drug companies involved.” Dorey was also harassing the Buttons by phone and had appointed herself the family’s unofficial conspiracy consultant. Shortly after I’d finally received a reply from Natasha Bita she published an article on the very rare past occurrence of transverse myelitis following oral polio immunisation. Bita did little to quell the fear and uncertainty to follow in the wake of Virus in the system. The purpose of her piece was to report on the MJA article, A no-fault compensation scheme for serious adverse events attributed to vaccination published by Kelly, Looker and Isaccs. I was familiar with the article having referred to it myself almost three weeks earlier. It’s inexcusable that Australia lacks such a scheme when we note Germany began theirs in 1961 and across the Tasman no-fault compensation has been a reality since 1978. Seventeen other nations have a scheme that relies upon WHO criteria for Adverse Events Following Immunisation (AEFI). It is of even greater relevance in Australia because arguments for its implementation rely upon factors anti-vaccination lobbyists deny. Firstly that vaccination provides immunity and secondly the principle of herd immunity. Any person who is injured while helping to protect the community — for instance, by contributing to herd immunity, such that there are sufficiently many people immunised to prevent widespread disease transmission within the community — should not bear the consequences of injury alone. In essence, the community owes a debt of gratitude to that person. Natasha Bita, whether consciously or not, fed the anti-vaccination machine. The piece firmed her position as a journalist lacking in scientific literacy or having a grasp of risk-benefit ratios. She belittles the term “adverse reaction” and leaves the most crucial fact that Australia’s current inactivated polio virus vaccine carries no such risk, until the last few words. In a poorly written piece she completely misses the reality that Australia’s vaccine injury chic groupies will not back this scheme, have never mentioned it and deny the merit raised by Kelly, Looker and Isaacs. When Virus in the system won Natasha Bita a Walkley for Sustained Coverage Of An Issue Or Event, she was embraced totally by the Dark Side. Her appearance on conspiracy and vaccine denialist site The Refusers perhaps underscored just how important a few lines reminding parents that vaccines save lives can be. On August 3rd, as Queensland mum Katrina Day lay fighting for her life against influenza, Natasha Bita published a fraudulent article falsely “linking” 10 deaths to influenza vaccines. Bita ignored the TGA warning on interpretation of data. The article highlights how dangerous it is to allow sensation-seeking journalists to consult such information. Her headline outs her as unconscionable and callous as she proceeds to ignore any difference between correlation and causation. TEN deaths have been linked to the nation’s flu immunisation program since the 2009 swine flu pandemic, including elderly patients and unborn babies. The CSL flu vaccine, Panvax – which taxpayers spent $131 million stockpiling for the 2009 swine flu outbreak – triggered 1716 adverse-event reports, including seven deaths. The Therapeutic Goods Administration database of adverse events, made public this week, lists the death of a grandmother who caught the flu after vaccination last year. To my knowledge Natasha Bita is yet to publish a retraction, explanation or apology. On August 27th it was reported that Katrina Day had passed away after falling into a coma. The 38 year old leaves behind four children and a husband. A disproportionately high number of children with neurologic disorders died from influenza-related complications during the 2009 H1N1 pandemic, according to a study by scientists with the Centers for Disease Control and Prevention. The report in the journal Pediatrics underscores the importance of influenza vaccination to protect children with neurologic disorders. CDC is joining with the American Academy of Pediatrics, Families Fighting Flu and Family Voices to spread the message about the importance of influenza vaccination and treatment in these children. Influenza kills and vaccination saves lives. For certain groups this is a very real decision arising every year. In very, very rare cases adverse reactions occur. To date in Australia no fatalities have been conclusively linked to influenza vaccines, including during the CSL debacle. It’s a shame that so-called “consumer editor” Natasha Bita has to mislead her readers to suit her own agenda.